When I was younger, we couldn’t afford to go away on holidays and instead went on day trips to which we could walk, get the bus or (most excitingly) the train. When we got to the station, the choice was between going right, to the beach or left, to London. My love of museums, exhibitions and probably history was created by these trips. One of those trips included a visit to Covent Garden where there was a shop that sold and displayed automata. I was old enough to not find them creepy and instead, was enraptured by the strange, not-quite-human movements and the complex mechanisms that made them work. 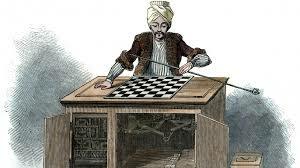 Although automata have not been one of my chief interests, I have always had a fondness for these complex gadgets. I can’t remember when I first heard of the truly grandstanding automata of the eighteenth century, but I rushed down to the ‘robots’ exhibition at the Science Museum to see the graceful, mechanical swan. 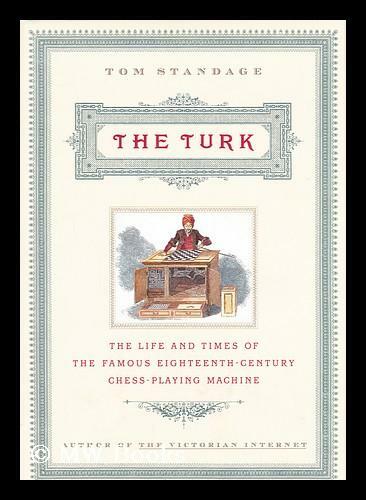 At some point, I also bought Tom Standage’s ‘The Turk: The True Story of the Chess-Playing Machine That Fooled the World’. This is a little book, slightly short with lots of space and a slightly larger font. That is not a detriment to the book - there are enough books around that continue long after their point has been made. This book comes in, tells a fascinating story with some intriguing implications and then goes away. I was a little unlucky that I knew the end of the story before I knew much about the beginning, it’s the ‘Sweeney Todd’ or ‘Jekyll and Hyde’ effect. Good thing this story starts so interestingly. The Turk was essentially created for a bet. A Hungarian civil servant called Wolfgang von Kempelen agreed to create something far more astounding than the slightly underwhelming magician who had just performed in Maria Theresa’s court. Six months later, he returned with a chess playing machine that appeared to run on clockwork. He then spent the rest of his life trying to encourage people to move on from that achievement. He may have created a speaking machine, steam-engines, bridges and fountains but it’s hard to live down a machine that can beat people at chess. When Joseph II (aka Jeffery Jones in ‘Amadeus’) succeeded Maria Theresa, he sent Kempelen on a two year tour of Europe to show off the Turk. It bamboozled, intrigued and provoked people everywhere it went. Most people agreed that the Turk couldn’t be a genuinely intelligent machine, that it must have some human intervention somewhere. Could it be magnets? If it was, how could the Turk still work with a magnet placed on it? It couldn’t be strings because the Turk could be moved about and set up quickly. Nor could the Turk have someone in it because the insides were opened up and shown empty before the game began. It also managed to inspire machines like the power loom and Babbage’s difference engines. Despite being pulled out for special occasions, the Turk was placed back in its crates, especially after Kempelen died - before coming spectacularly back to life. The Turk had been sold to Johann Nepomuk Mälzel, who was a creator of musical automata which could do things like genuinely play the trumpet. Mälzel was a skilled showman, and an inveterate spendthrift who had to keep moving when his debts caught up with him. The Turk was his most reliable money-spinner, which mostly kept him in funds until his death and was passed to another owner. Unfortunately it was burnt when the museum displaying it burnt down. The Turk played famous names and famous games but the most famous thing about it was a question, 'how did it work?' Readers of the book will have this question answered. It's nice to have a story like this told with authority and brevity. It’s certainly worth a few hours to find out everything you might want to know about the Turk but will not tell you one thing more.